Don't these look like mom pants? When I bought them I certainly didn't think so, but now looking at the pictures I'm convinced that they are. I suppose I should get a fanny pack to complete the look. Ha. I did a post with these pants too! I thought that they were cute!!! I like they way you styled them!!! Great scarf! The color is beautiful! I like the pink pants! Maybe they'd look like mom pants if you'd styled them differently, but I think you look great! LV sells some very fashionable fanny packs! Great look!!! Love these pants and thanks for the Asos link . Yes they do but in such a fashion way!! I luv this outfit, great post darling!! Kiss kiss and dont forget to visit me! Hi Khatu! I love 'em pants! Can't rock them like the way you do, though. I think they have the potential to become mom pants but the way you style it is definitely anything but! I love the color paired with the blue scarf! I'm dying to get one of the McQueen scarves. It looks great paired with this outfit! I saw these pants at H&M but didn`t bother trying them on because I didn`t want to have another bright pink piece in my wardrobe that would likely not get too much wear. I feel like they are just missing something, a detail or something like that. But I like the outfit you paired with it. This is anything but mom pants. And whose mom would be wearing such a great scarf, really?! I like your mom pants! You definitely rock them. While I think my mom may have some similar pants lurking in her closet from my childhood years, she definitely does not have a scarf or leather jacket like yours. Love this outfit! Leave it to the fabulous Khatu to rock the mom pant so well! tee hee. You're way too stylish for those to be mom pants! Love your jacket. Haha, I see what you mean about the "mom pants" look, with the high waist and tapered leg, but they're still SUPER cute. Not very many people can rock mom-esque trousers, but you did! loving the pants!! the scarf and the bold accessories. i love mom pants! i have two pairs, one is more extreme than the other, but I think as long as you like them, that's all that should matter. that's what I tell myself anyway :) you look great! The way you styled the definitely updated them! 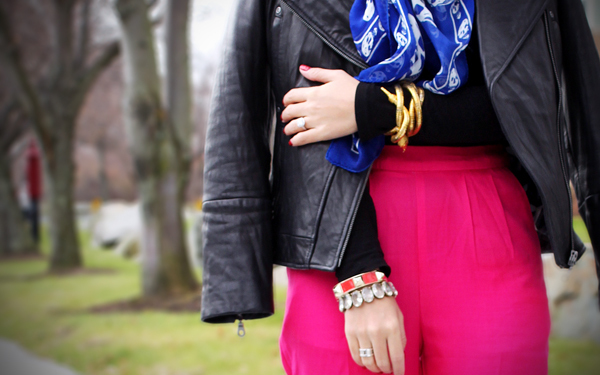 Love the combo of the pink pants and the blue scarf. I have the same pants, in black too! You look great! I think the bright pink makes them look less mom like. They work on you though! I like this outfit! The colors are great! hahaha, I have the same pants and I didn't think so much about it before but now that you've mention it, it does look like "mom's" pants =) But you wear it so well! Happy Lunar New Year if you celebrate it dear! I recently found granny pants, exactly like this one, in the exact colour, in a Vintage store, for R35 - that's just over $4!!! Thanks for the inspiration, now I now how to dress it up. LOL! They kind of do, but not the hot pink :P I tried these on too and surprisingly I liked them but I found I could see through them and I didn't think I'd get much wear out of them so I passed. You wear everything so well Khatu! Thankfully LV and Gucci make some OK fanny packs, LOL. i have the same exact pants! check out my blog to see how i styled them!! !